Download YouTube to iPhone and have more fun! mediAvatar YouTube to iPhone Converter Mac makes it easy to download videos from youtube.com and convert to iPhone files - just one click to achieve these. You have the options to convert YouTube videos to iPhone MPEG-4, H.264, MPEG-4/H.264 for TV, MP3 and WAV music, which are compatible with all iPhone models including iPhone 5. Providing built-in player in it, this YouTube to iPhone Mac converter makes you browse, preview, search, and download YouTube videos very conveniently. And in another way, when you browsing youtube.com website with Safari, you can directly drag videos to the drop-zone of this software to download and convert the YouTube video to iPhone. Download videos from youtube.com, convert and put on your iPhone to have more fun only with mediAvatar YouTube to iPhone Converter for Mac. Only one click to download YouTube general and HD videos and convert to iPhone video and music files using mediAvatar YouTube to iPhone Converter for Mac. Besides online YouTube videos, you can also convert FLV and MP4 HD videos on your computer for iPhone compatible videos and music. With the browser, you can browse, search, and preview videos as in safari and it makes it more easily to download YouTube videos from the built-in browser. Not only download YouTube videos to iPhone in the built-in browser, you may also "Drag & Drop" or "Copy & Paste" YouTube video URL to this Mac YouTube to iPhone converter to start new downloading task. Pause, stop, restart or delete the YouTube downloading/converting tasks freely. All at your control. 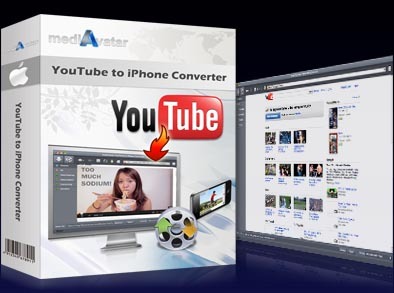 mediAvatar YouTube to iPhone Converter for Mac allows you to configure the proxy server to download videos from YouTube. This Mac YouTube to iPhone Converter supports batch processing and multithreading to download and convert multiple YouTube videos to iPhone movies or music simultaneously. Preset a post-download action to exit, or shut down, hibernate, stand by system automatically after the YouTube to iPhone downloading or converting completed. Export and backup iPhone contacts to Mac as .csv or .vCard, share iPhone contacts with other address book and import contacts in.csv or .vCard from other address book.